It’s the season to be in Goa. 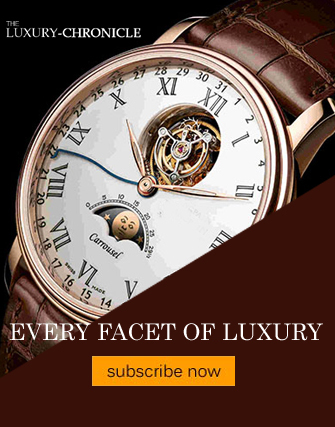 To kneel at the pews in old churches, Noel, music, New Year celebrations, the excitement of the famous Goan Carnival in February, or just to be one amongst the many at the crowded beaches and busy shacks that are ever in party mode. Motivated by the words of the American writer Henry Betson –“The three great elemental sounds in nature are the sound of rain, the sound of wind in a primeval wood, and the sound of outer ocean on a beach’, I chose to visit Goa in the months, which in the Hospitality industry and sea-farer’s calendar are marked as ‘off season’. I wanted to experience the monsoon magic, the silence and quietude by the ocean, away from the noisy environs of Delhi where the rivers of traffic flow endlessly over concrete flyways. The real test of a seaside resort is to keep the guests engaged when the outdoor attractions are out of bounds due to inclement weather. 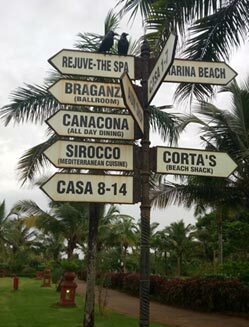 My destination for such a test was the Lalit Golf & Spa Resorts, located in the deep southern part of Goa at Raj Bagha, Canacona, close to the Karnataka border. 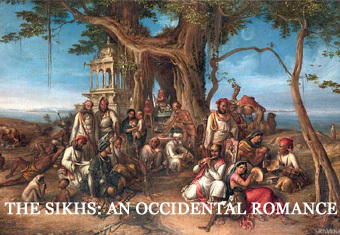 The sprawling 100-acre property, hemmed in by the Talpon River to the south, the Arabian Sea on the west offered the perfect escape. Now, standing here facing the palm fringed yellow and white Mediterranean style, expansive building, I thought I had arrived at the mansion of some Colombian drug lord or a Spanish hacienda. Not to get the geographies mixed, this was indeed the emerald state of Goa, the hippest beach destination in India. 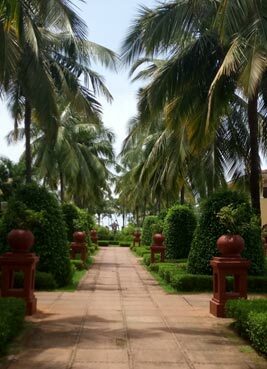 The resort was nothing like its cousin further south along the same coast line, The Lalit Resort & Spa Bekal, in Karnataka. To the credit of The Lalit chain, each of their properties is different from the other, and bears the legacy and heritage of the region. Though the Lalit Resort in Goa was custom built in the 90’s, the architecture is in sync with the Portuguese heritage of Goa, the stucco wall, arches and pitched roof, long corridors, the ornate cornices, the manicured garden with a hedge maze, and above it all, the signature reception lobby of The Lalit that is open on all sides and inclusive. 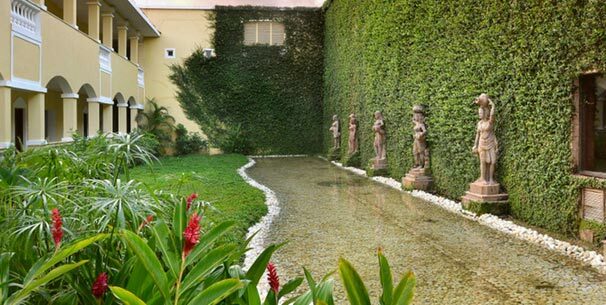 The spacious space with high vaulted ceiling opens out into a lush garden with the sea breeze drafting through. 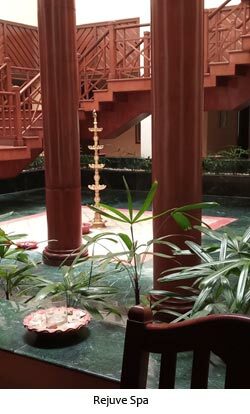 The meandering verandas of the many wings house nearly 250 spacious rooms and suites, with the smallest one being 615 sqft in area, going up to 850 sqft, and 3000 sqft in size. So staying confined to the room was not going to be a congested operation, as I had planned to soak in the monsoon magic, the sound of rain falling on the roof and in sheets outside the balcony, dark clouds rolling in from the sea. This was not to be as the monsoons in Goa had wrapped up early, leaving behind clear blue skies. I took a spin around the property on one of the many golf carts to make the most of the good weather. 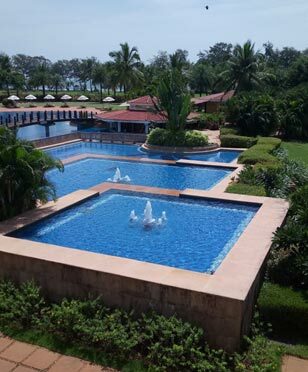 The Lalit Goa has a mean 35-acre golf course that swings around the grounds, with long fairways, half inland and half on the beach. The 9-hole, double T golf course starts inland. The holes 3 and 5 are along the river, and hole 6 is the iconic point from the river to the beach. The challenging element of cross breeze is what makes this golf course a prominent venue for tournaments. Trainers are available for beginners and learners, who have different hitting points. There are bikes and motorized carts available for anyone wanting to explore on campus. There is a special room for little children with all the play stuff, a TV, videos, books, games, and a supervisor. The blue waters of the split-level pool with fountains and many stone turtles and fishes spewing water is a very tempting proposition. 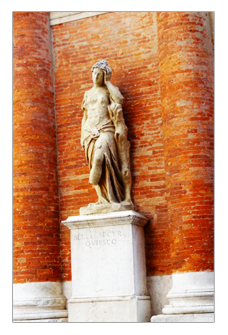 It is a busy place with children and other assorted age groups cavorting in it. The sunken shack Gazebo next to it provides a regular top up of sangrias, coconut water, grills et al. The beach alongside the property is nearly private. By ‘nearly’ I mean that as per Goan law, the beaches are to be freely accessible to all and cannot be owned by the hotels, but as the beach alongside Lalit has the River Talpone flowing into the ocean on one side, it has a little hillock on the northern edge, cutting it off for the drifters. Though a public road cuts through the property and gives free access to the locals, it is just the fishermen and a few shack owners who visit. Post monsoons, the Lalit’s beach shack, Cortas, which seats 84 is packed at all times. The exclusivity of the beach allows the hotel to host special beach dinners on request. Talk about romantic settings! I have two weddings and a silver anniversary coming up in the family, in the near future. With that planning running as a theme at the back of my head, I checked and verified the venues, support systems, tariffs et al. The exclusive beach, which The Lalit enjoys by virtue of its geographical setting, makes it the perfect venue for that destination wedding by the sea, or beachfront parties at Cortas. 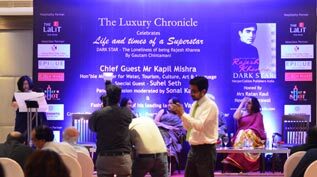 The GM Kumar Manish confirmed the Lalit’s popularity as a wedding destination in Goa. Not surprised, given the large vistas and living areas, which can host a peppy wedding without disturbing the other guests. 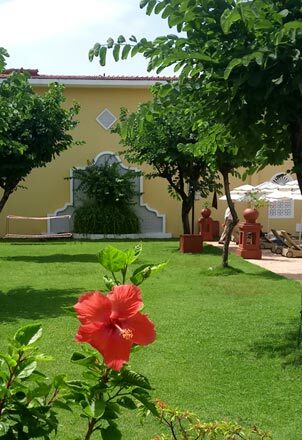 Also the hotel has a staff count of nearly 500, who live on the grounds or the villages around the property, having ample manpower for a mega event. There are also 10 well appointed, independent villas with four bedrooms, private pool, valet service, kitchen, that make an excellent venue for families to set up home-away-from-home vacations. 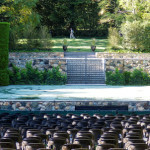 The venue is totally independent and private, surrounded by tall hedges and trees. 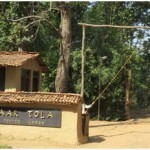 Bollywood has made its forays, and the row of villas, specially villa no.9, have been featured in several movies. The most important element of the holiday is the food. We made a very happy and fruitful acquaintance with the amazing Executive Chef Tanmoy Majumdar, who commands all the kitchens at the resort. The 24-hour restaurant on the ground floor, Canacona is the busiest. The lavish multi-cuisine buffet spreads for breakfast, lunch, dinner or the à la carte menu require a few hours to taste it all. A morning well spent. Pan cakes with 8 types of topping, strawberry yogurt, kiwi smoothie. The calorie conscious have a treat with assorted grills and glazed vegetables. All breads are baked in-house. There is a very busy and productive kitchen garden on the grounds, in keeping with Lalit’s motto of ‘We Serve What We Grow’. I had my first tasting of some of the local dishes, such as the healthy Goan poi bread or Bakhri, Filos (banana pancakes), Khole (sweet rice cones in jackfruit leaf). Be serenaded by the two merry Goan singers at dinnertime. In season, do make bookings. The Canacona seats 75, but one has to wait one’s turn sometimes. The Sirocco on the upper floor has live kitchen counters. The glass windows and terrace give a grandstand view of the sea. 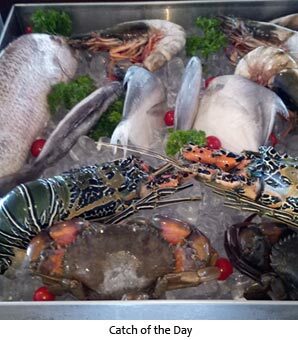 The recently caught seafoods is chilling in the ice. The Lobster Thermidore is a MUST. 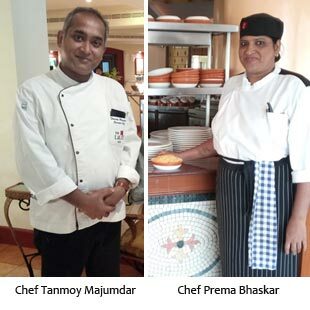 Goan Chef Prema Bhaskar is a local. She is a marvel and a dear. Do not leave unless you have eaten the lemon butter lobster, or veg Caldeen cooked by her. 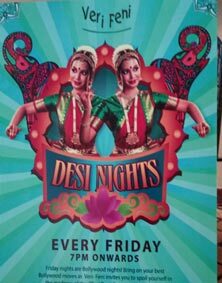 The bar Very Fenni hosts Desi Nights every Friday on popular demand, with a DJ, dance floor and the works. The pool tables are a draw. 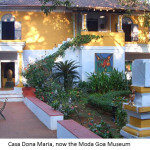 The original works of the famous Goan cartoonist Mario Miranda were a treat. 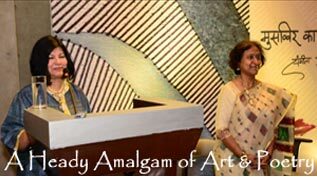 In fact, there is ample art adorning the many walls of The Lalit Goa. 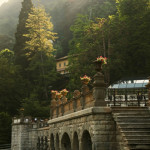 The famous Rejuve Spa is a happy place. Make bookings and try out their treatments range from Ayurvedic massages or Swiss or Thai. The options are too many to list here. Terrific facilities for joint sessions for couples. Saunas, Gyms, Jacuzzi, beauty parlor, hair dressers – all welcome activity to be indulged at leisure. The Spa and all the rooms stock KronoKare skin care products by Cyril Feuillebois. They are also available at the in house shop Aum, that also retails interesting range of knickknacks from hats, trinkets, colorful outfits, swimwear, and beachwear, slippers et al. 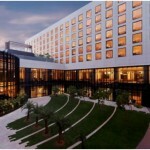 It is good to know that The Lalit is following sustainable practices. The MD Manish informs that the hotel provides sustenance to surrounding region. The majority of the workforce employed at the property is local. Also, there is secondary level of employment as transporters, fishermen, farmers, guides etc. An observation – The sunken shack, Gazebo, near the swimming pool plays loud party music all day. If you want some silence or want to hear the sound of the sea, avoid rooms overlooking the pool.